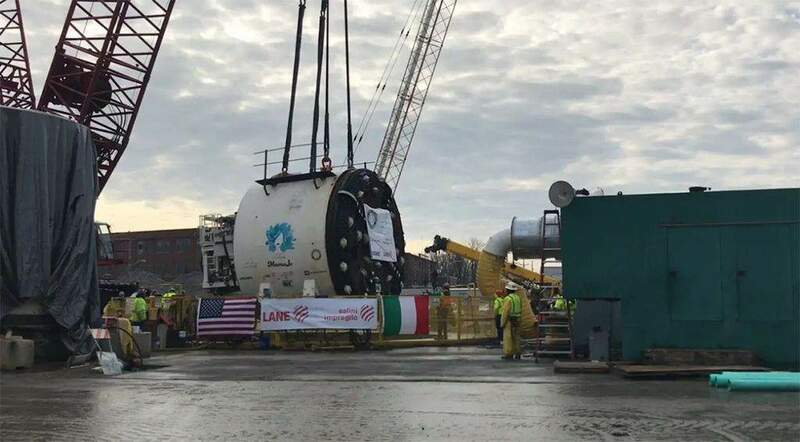 The first portion of the tunnel boring machine that will cut a five-mile long tunnel beneath the surface of Fort Wayne was lowered into ground today, city officials announced. At 200 tons and 16 feet long, the cutterhead is one of many pieces that will make up the machine. It was lowered more than 200 feet into the ground. "Standing at a diameter of more than 19 feet and stretching more than 400 feet in length, Mamajo will begin her journey on one of the most significant projects in the history of Fort Wayne," city officials said in a news release. "She will grind through bedrock to build a five-mile-long sewer tunnel, more than 200 feet under the earth's surface, with an interior diameter of 16 feet." At $188 million, the tunnel project is the largest public works project undertaken by the city of Fort Wayne. The tunnel is an integral part of the city's consent decree with the U.S. Environmental Protection Agency, which stipulates that Fort Wayne must reduce the average annual number of combined sewer overflows to four by 2025. Crews will continue lowering pieces of the tunnel boring machine and connecting them underground over the next two months. Once the tunnel boring machine is fully assembled in early spring, it will move three feet per hour five days a week. Completion of the tunnel is expected by 2021, with connections to Fort Wayne's neighborhoods complete in 2023. The tunnel is expected to be operational that same year.